Simmons has been manufacturing furniture for almost 140 years already and they have totally mastered bringing the highest grade of comfort to their users. As a result, this brand has become one of the largest providers of upholstered furniture in the United States. 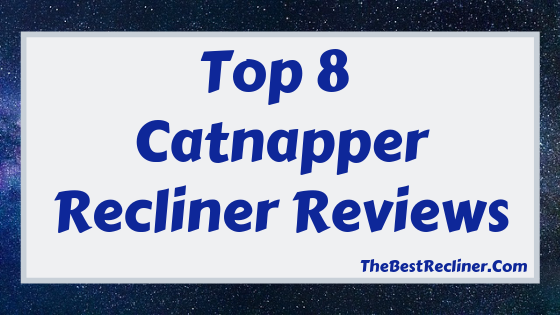 In this article, I will be sharing with you the best Simmons recliner reviews and hopefully one of these recliners may just turn out to be the perfect fit for you. So please keep on reading below. 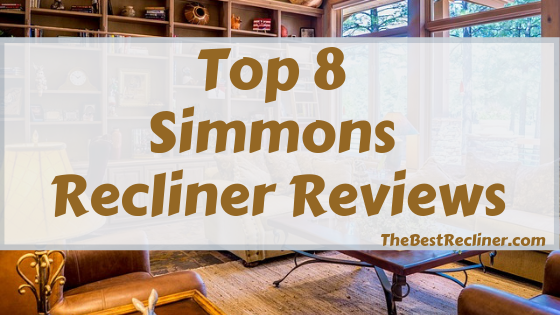 But before we proceed to some of the best Simmons recliners, let’s first take a look at the best features a Simmons recliner has to offer so we can fully understand why American households love them so much. First of all, Simmons have prioritized durability with their products. Their recliners were built using a hardwood frame on a signature steel base, so they will be incredibly durable. We know for a fact that these are among the strongest materials that can be used for recliners. As a result, most of Simmons recliners hold weight remarkably well and some are available in large sizes that accommodate a wide range of users. Simmons recliners don’t have a complicated recline mechanism. All you have to do is pull a simple lever that is just within your reach, whenever you want to lean back. The recline is not only easy but very smooth also. Of course, providing comfort has always been the brand’s upmost priority. So their recliners have been upholstered using very soft polyester fibers and have been overstuffed for maximum relaxation and enjoyment. Though Simmons recliners were designed with many variations, all of them are still using the same principle of quilted segments that greatly relieve any pressure points on your back. The foam and springs, on the other hand, are combined inside the padding to make sure there is superior comfort. 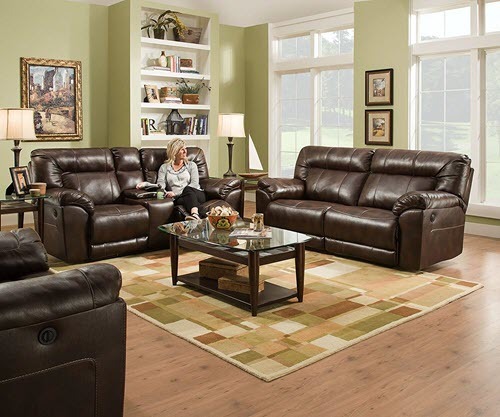 It’s also great that Simmons recliners are available in a large variety of styles, colors, and functions. The brand definitely succeeds in trying to accommodate each and everyone’s needs. Simmons have really set the standard for a good quality, comfortable recliner. For instance, most of Simmons recliners are rocker recliners which are great for nursing moms, senior citizens or anyone who finds it soothing to rock back and forth in a big, comfy armchair. Simmons also has massage recliners, some even feature heated massage functions. However, what makes Simmons amazing is that no matter how many updates it creates, it will still be very easy to use. It will just take pressing one or two buttons to begin a series of comforting vibrations or heat on your body. 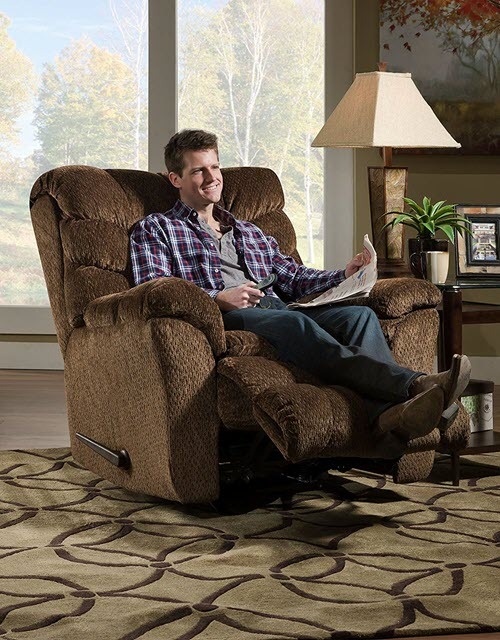 The Bandera Mocha Rocker Recliner is one of the best recliner chairs to roll out of a Simmons warehouse. It is built with plushly stuffed leg and armrests for added comfort. Also, foam has been combined with Beautyrest pocketed coils, and embedded in the seating. Beautyrest’s system of pocketed coils work while you are relaxing by providing targeted support. Hardwood lumber has been placed in all the load-bearing areas of the frame. High-density foam seat cushions and sinuous wire springs have been used for extra comfort and support. It very easy to assemble. It comes with a USB charger that makes things even more convenient. This huge, roomy and comfortable rocker recliner would definitely be a great addition to your living room and will help you relax after a hard day. If you think a chair can’t be both irresistibly comfy and super stylish, then you’ve never seen the Simmons Swivel Glider Recliner. It’s a triple treat for anyone who wants to relax after a long, tiring day at work. 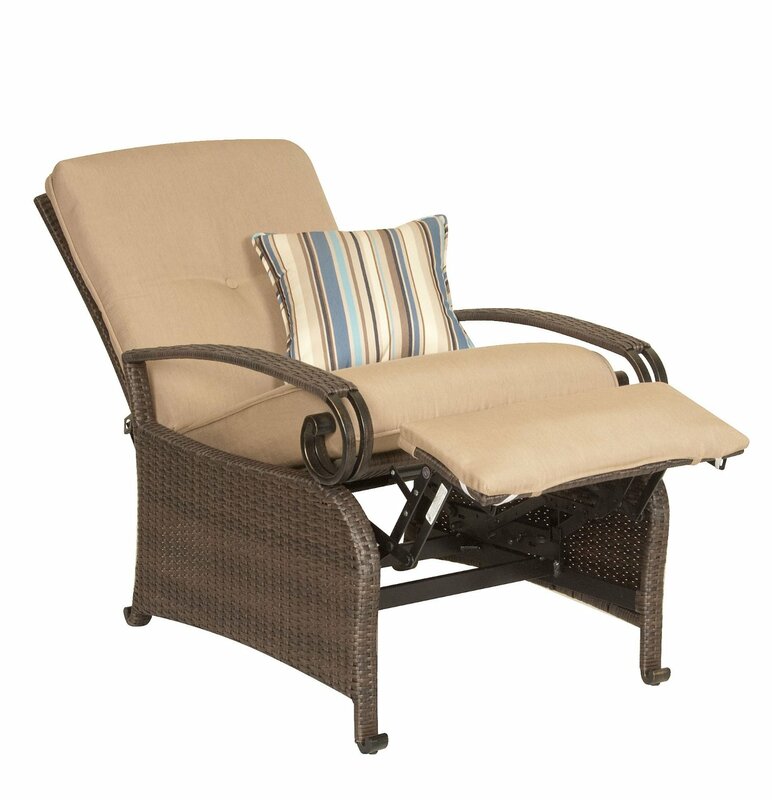 This chair features convenient swiveling, comfortable gliding and deep reclining functions. It offers the same convenient swivel functions of an office chair but in a more comfortable and gorgeous design. It’s gliding feature, on the other hand, also provides a soft back-and-forth motion that is really soothing. It’s a nice chair with a beautiful chocolate color that will make any living room look good. It’s also safe to use in a baby’s nursery. It has a fully padded chaise, radius arms that are covered with a very comfortable and soft to touch plush polyester upholstery. It also features Beautyrest pocketed coils on its seat cushion, for added support. Hardwood lumber has been placed in all of the load-bearing areas of the frame, for extra stability. With the smooth swiveling, gentle gliding and deep recline features of this chair, I’m sure you will be lulled right to sleep. It will help you get the rest you’ve been craving for and exactly how you want it to be. If you don’t want to invest in a big couch yet, this recliner is your best bet. It is something that can take the place of a couch and will function like one. This recliner will a great choice for couples as it has been made just that bit bigger so two people will fit. It is a great loveseat style chair for cuddling and relaxing together. This recliner also has the same style as other Simmons recliners. For instance, it has a firm base that covers up all the mechanical pieces that could be unsafe for your toddlers or even pets. 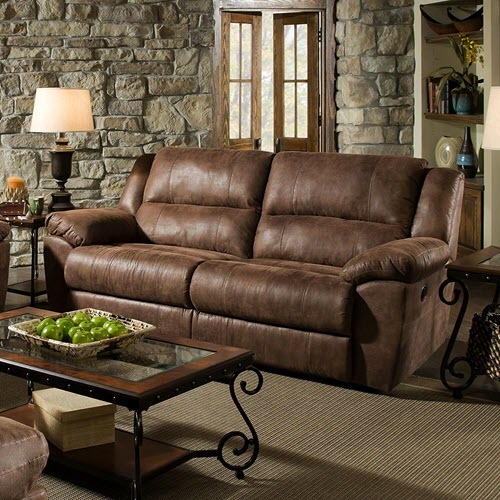 It also features performance, leather-like fabric with a very natural grain texture style. 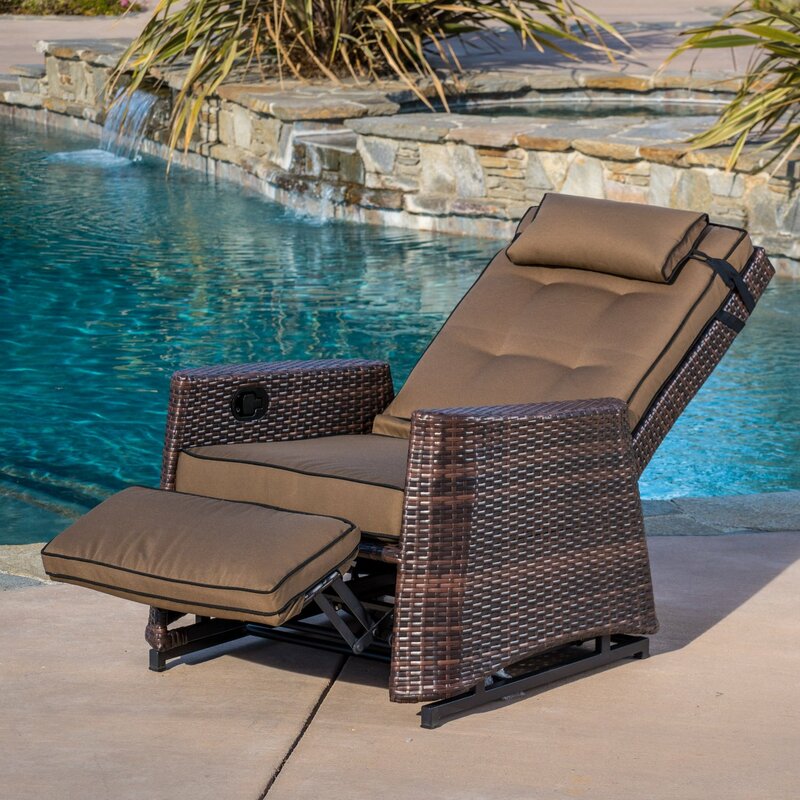 It features high waterfall backs, a pad over chaise, a deep and plush seat as well as a heavily padded, radius arm design to provide you with superior comfort. Its power button comes with a USB that allows you to charge your devices. It also has a 2.1 amps rating for faster charging. There’s also a nice blue LED light. Hardwood lumber is used for all the load-bearing areas of the frame. If you want to give yourself the best seat in the house, then let the Abilene Power Cuddler Recliner do the honor. Indeed, the people at Simmons never stopped improving their services, just to keep their customers happy. They have done it again by creating the Phoenix Mocha Cuddler Recliner. This recliner has definitely been designed with extra comfort in mind. For instance, it uses Beautyrest pocketed coils for its seating cushion instead of sinuous springs. As a result, the seat provides ample support and a greater suspension feel to the user. In addition to that, the chair has also been covered with performance fabric upholstery which not only looks great but is also very comfortable to the touch. It uses PU leather material which is mainly a leather backing that has been covered with polyurethane coating. This is why it has a softer look compared to real leather. The chair’s reclining functions can be easily activated using the handle found on the recliner’s side. It has a strong frame created using steel mechanisms as well as a steel rocker base. The chair has a wide frame that will support your back and head. It actually comes in a broad width of 50 inches, making this chair ideal for big and heavy people. It uses high-density foam for its padding, to make your experience much more comfortable. The back, seat, armrests and even the footrest are padded. What’s even more great is that this thick foam padding will not easily disintegrate or break down through time. This recliner is easy to maintain. You can simply wipe it down with a damp cloth and it will keep on looking brand new for years to come. Designed to be nearly silent, this recliner is great for rocking you or even a fussy baby to sleep. It has a removable back so it can be easily moved and positioned around. Every feature of this recliner, from its supple wire springs, to its high-density foam seat cushions, will make sure you will have total relaxation and great comfort. And most of all, it’s affordable and just looks amazing. Well, who doesn’t want a recliner that offers both comfort and durability? Luckily, Simmons Aegean Heat and Massage Rocker Recliners are among the best options you can choose. What made this recliner popular is its therapeutic features. As its name suggests, this seat comes with heating and massage features. You can choose from the three vibration levels and two heating settings. The vibration massage motion will send pleasing, soft pulses all over your body. While the heating and massage functions can work together or individually, this means you will be in full control over how you want this recliner to work. 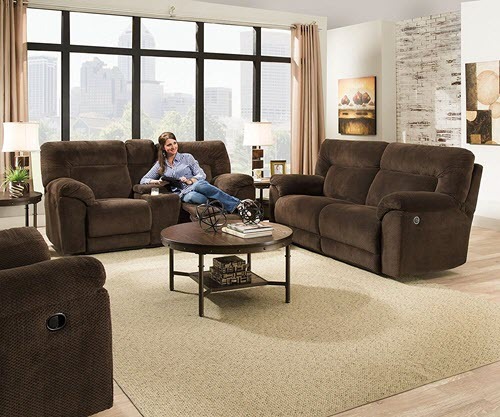 Though you might notice that this recliner has not been as generously padded compared to other Simmons recliners on this list, it is still very comfortable to sit and recline on, as it is covered with high-quality fabric. It is made of durable materials like a metal base and hardwood frame, making it tough enough to support people on the heavier side. This recliner can hold around 250 pounds. Unlike other massage chairs, this amazing recliner does not have any hard lumps on its back. It has a wide back that allows you to roll over to your right, scoot over to your left or spread out as you want. There will still be space to spare at all times. If you’re someone who wants a relaxing massage in the comfort of your own home, I’m sure you would find this fabulous recliner a good investment. 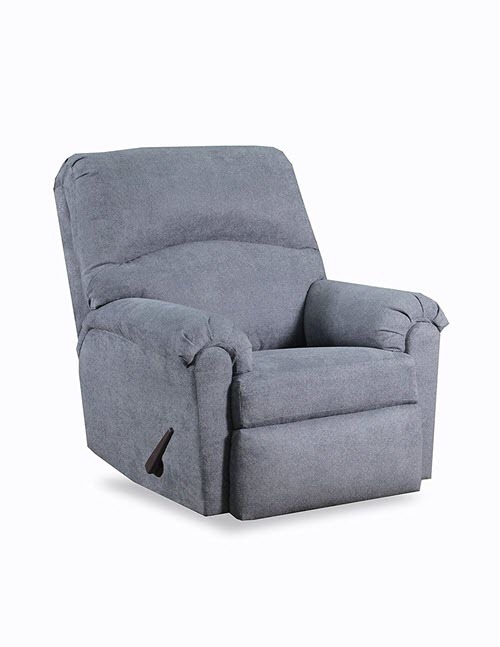 This power rocker recliner from Simmons is a new take on a modern style recliner. What makes this recliner unique is that it allows you to charge and plug in your gadgets like your mobile phone or laptop and get similar charging power as a port in a hotel room or a coffee shop. This means you can still work and at the same time recline and relax as much as you want. If you think the Mia Espresso will not blend with your interiors, you can check out Mia Latte and Mia Denim. This chair is 37 inches deep and 38 inches wide. It has a height of 40 inches and weighs about 80 pounds. However, the great news is that it doesn’t require any assembly at all. Hardwood lumber has been placed in all of the load-bearing areas of the frame. It uses sinuous wire springs as well as high-density foam seat cushions to make sure there will be comfortable seating for all users. Its back is also removable for easy moving and positioning. 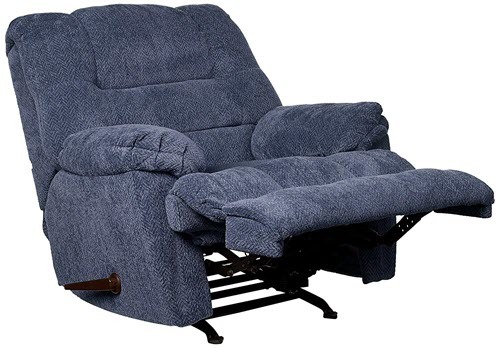 The Simmons Power Rocker Recliner is definitely great value. It has been beautifully tailored and is durable and easy to maintain. 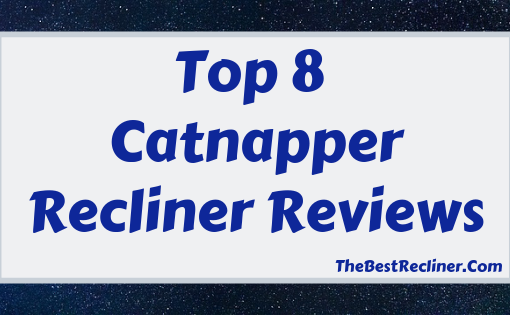 Are you looking for a trusty manual recliner you can sleep tight on? 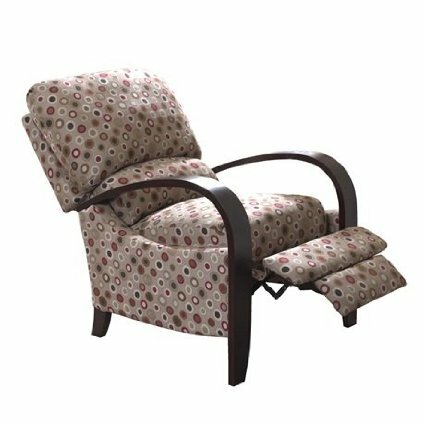 Check out the Zig Zag Rocker Recliner, I’m sure this is going to be your best friend, especially if you find it soothing to be rocked to sleep. The rhythmic back and forth motion of this recliner will you put your mind in a meditative state. Plus the comfortable cushion is just amazing. Its back, armrests, and footrest have been generously padded and well-stuffed. Just taking a quick look to its ample stuffing will make you want to sit down, lie back and rest. With all these great features, does that mean this recliner comes with a hefty price tag? Absolutely not! 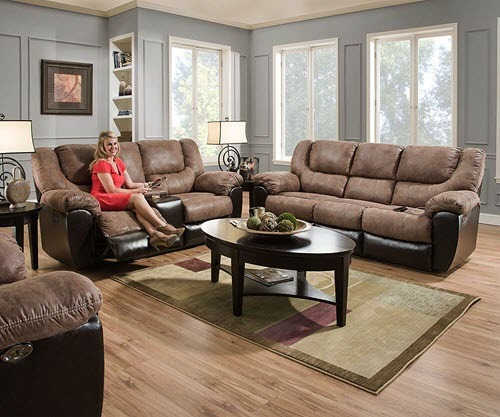 It provides the comfort you will find in higher-end recliners, but with a mid-range price. You can choose from the four different colors according to your style. There’s Blue, Brown, Green, and Wine. The Zig Zag Rocker Recliner is very easy to assemble. This recliner is well-made, very comfortable and is available in beautiful colors. I guess it is safe to say that this is one of the best and most comfortable manual recliners out there. This double motion sofa is a popular choice for movie lovers. With this recliner, you can have everything you need to have a relaxing evening cuddling and watching your favorite TV series. Its fully padded chaise is really spacious. It has an ample seat and back area, that can accommodate up to three adults with some extra room to spare in the armrest area. It also comes with thickly padded arms as well as a stable frame that will not squeak. It also features Beautyrest pocketed coils inside its seat cushions, to provide superior comfort. It has been covered with an ultra soft distressed bomber jacket PU cover that is durable and will last a long time. The reclining mechanism of this chair works very smoothly. You can switch from sitting to a reclining position with ease. With the combination of its comfortable cushions and wide back and ample space, relaxing with your partner on this Simmons sofa recliner will always be your favorite part of the evening. Simmons have a long history of producing recliners that people love. It has over a century of experience when it comes to crafting comfort. It is a tried and tested brand, delivering high-quality products each and every time. No wonder why Simmons has become a very famous furnishing brand in the United States. 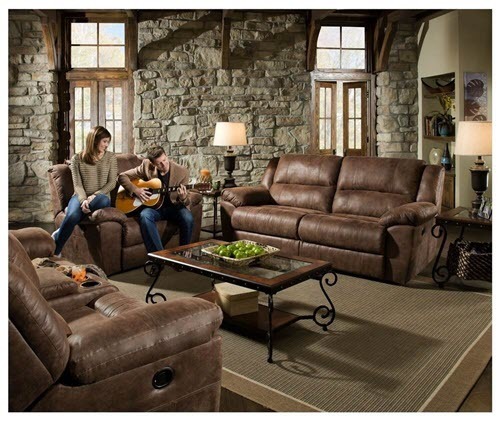 The Simmons recliners I mentioned above are just some of the best models this brand has been able to produce so far. How about you? Which among these Simmons recliner reviews do you think would suit your style and preference the best? Comment down below with your answer. I would love to hear your opinion on this top brand!